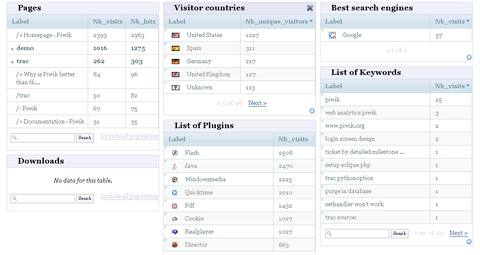 Piwik is an open source web analytics software. It gives interesting reports on your website visitors, your popular pages, the search engines keywords and etc… Piwik is built with plugins: you can add new features and remove the ones you don’t need. Piwik being installed on your server, the data is stored in your own database. You can very easily embed your graphs in your blog or website or dashboard. If you are a developer, you can definitely help. One of their main mid term objective is to make it easy for external developers to build plugins for Piwik. Help is also welcome if you want to work on the core of Piwik: there are lots of interesting problems to solve, new features to implement and bugs to fix. You might also want to check out Open Web Analytics (http://www.openwebanalytics.com). It’s a PHP/MySQL alternative to Google Analytics but has some different features than Piwik including click Heatmaps and mouse recordings.